The big day has finally arrived. No, we’re not talking about Valentine’s Day or Brexit day, both of which the nation is undoubtedly waiting for with bated breath. We are, of course, talking about National Pizza Day. Whether you’re heading out for a meal with friends this Saturday 9 February, or staying in for a night of TV and takeaways, your day will be made that much better with a delicious, discounted pizza by your side. Several eateries are offering mouth-watering deals on pizzas, including Domino’s, Papa John’s and Pizza Hut. If you’re a fan of pizza, you’d be a fool not to take advantage of them. Yes, you read that correctly. Domino’s is offering its customers the chance to win a year’s supply of pizza, simply by giving one of the pizza delivery company’s most recent tweets a retweet. Sure, your chances may be slim, but someone has to win, right? If you don’t fancy your odds at winning an unimaginable quantity of pizza, then you could make the most of the deals on offer on the Domino’s website instead. The company is offering 30 per cent off its Pizza Legend, which allows you to customise your own pizza, and buy one get one half price on pizzas when the second pizza is either of equal or lesser value than the first. For National Pizza Day 2019, Papa John’s is offering 33 per cent off when you spend £30 or more on pizzas or sides. The deal is available on the website and at the restaurant’s hundreds of local stores nationwide. To find your nearest Papa John’s chain, enter your postcode here. If you download the Pizza Express app, you could be treated to complimentary dough balls until 11 February in celebration of National Pizza Day. That’s not all, as the restaurant chain is also offering a set menu of three courses for £13.95. What’s more, for every sale of a Padana pizza, Pizza Express donates 25p to cancer charity Macmillan. To see what deals are on offer at your local Pizza Express restaurant, enter your postcode here. When you spend £30 or more on pizzas at Pizza Hut, the restaurant will cut your bill in half. This means you may only end up spending £15 on £30 worth of pizzas at the American restaurant chain. Side dishes and drinks aren’t included in the offer. Just when you think pizza couldn’t get any more exciting, New York-inspired restaurant Mulberry Street Pizza goes and creates the pizza-bagel hybrid of our dreams – the ‘Bagelizza’. Created in collaboration with New York Bakery Co., the Bagelizza measures 12 inches in diameter and is topped with pastrami, sauerkraut, swiss cheese and Russian dressing. Mulberry Street Pizza is giving away free Bagelizzas to 200 customers at midday on 9 February on a first come, first serve basis at its Notting Hill, Queensway and Bayswater branches in London. Deliveroo orders of the dish are also free from midday. Together, KFC and Pizza Hut have gone big for National Pizza Day 2019. The dish is currently being tested and trialled by Pizza Hut Delivery and KFC. The eateries haven’t yet revealed when the pizza will be made available, although many pizza fans have expressed their excitement over trying the dish. 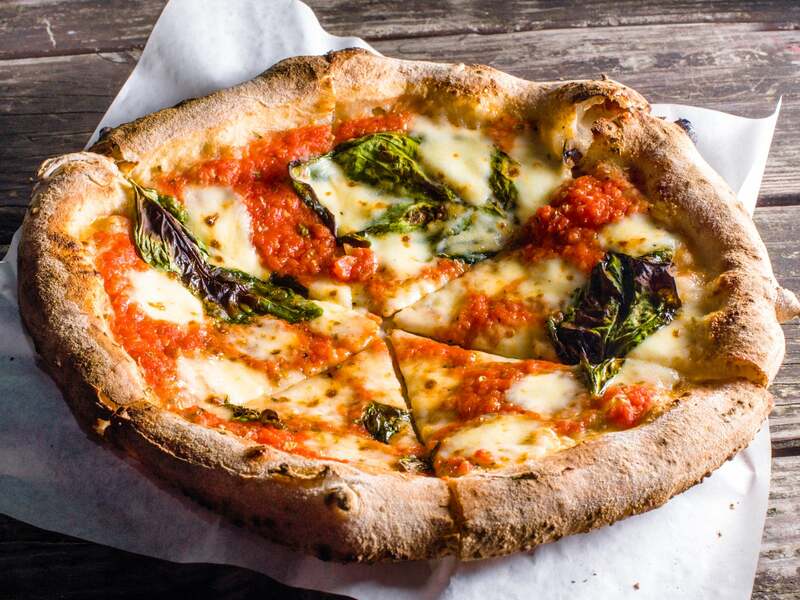 As part of National Pizza Day, you can claim 30 per cent off pizzas at more than 600 locations across the UK, thanks to food and drink magazine Foodism. To check out all the participating restaurants and claim your voucher for the discount, click here. The Foodism initiative is being supported by Action Against Hunger, a global humanitarian organisation that strives to end world hunger.